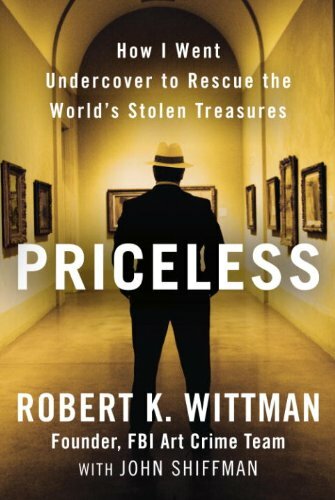 I recently finished reading Robert K. Wittman's book Priceless: How I Went Undercover to Rescue the World's Stolen Treasures. I had waited several weeks (months?) to get my hands on a library copy of this book, and became even more anxious after reading this great review of the book on Truth, Beauty, Freedom and Books. The wait paid off, though. Not only is this book entertaining and informative, but it also gives a really interesting perspective on art. As an undercover FBI agent, Wittman has to be informed about the historical significance of the art in his cases, but it is also clear that he views art as objects and historical artifacts. There definitely is nothing wrong with this perspective, and it is a logical perspective for Wittman (since he's interested in recovering a physical object that has been stolen). Anyhow, it was interesting to think about Wittman's apparent "art as object" perspective, since art historians sometimes forget that a work of art is, in its essence, an object: art is paint on a canvas, a block of marble, or metal. I think art historians often "mysticize" or elevate works of art to the point that the objects are exempt from their actual physical properties. Gombrich, for example, tried to humanize art by comparing it to the complexity of "real human beings" (see here). In some ways, I don't have issue with this perspective either, but it's interesting to think about how art historians sometimes divorce themselves from the physicality of the art they discuss. But I digress. The point is: it was interesting to see Wittman approach art from a different (more practical?) perspective than I usually encounter among art historians and critics. I'd recommend this book to anyone who likes art crime. I think Americans will find the cases especially interesting and meaningful, since Wittman recovered many objects that are significant to American history. However, there are several European pieces that Wittman also recovers/mentions. Really, though, I think that this book would appeal to most people who are interested in art and art crime. 2 Robert K. Wittman, Priceless: How I Went Undercover to Rescue the World's Stolen Treasures (New York: Crown Publishers, 2010), 174.